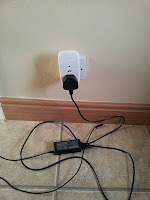 Previously I blogged about the power consumed by my phone charger and I concluded that it was nothing to get too worried about. However, laptops typically consume much more power than mobile phones and so it is to be expected that laptop chargers will consume significantly more power than phone chargers. Therefore I decided to do a similar measurement on the power consumed by my laptop charger. The laptop I used for the test was a reasonably old Compaq and the charger is not the original one which came with it (the original died a few years ago). 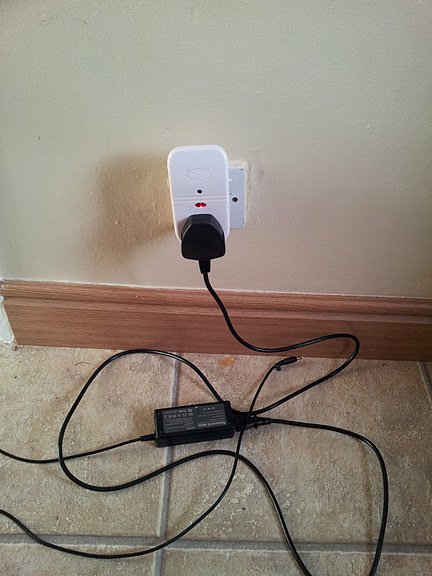 I leave my laptop charger almost constantly plugged into the electrical socket in the wall, but for the purposes of the test I connected it through the Individual Appliance Monitor as shown in the picture. I checked the power consumed by the laptop charger when there was no laptop attached and like the phone charger it was consuming 0 watts. I waited until the laptop battery was well drained and then I plugged it in. The charger immediately started to consume about 63/64 watts of power. I put the laptop into sleep mode, but the power consumption of the charger did not decrease (presumably because it was still busy charging the battery). After 2 hours the power consumption gradually decreased to 1/2 watts but not to 0. I assume that this is because the laptop is still consuming power in sleep mode. To eliminate all power consumption I would need to either unplug the laptop or else put it into hibernate mode. The charger consumed roughly 0.05 KWh to charge the battery fully. At current electricity prices in Ireland this would cost slightly less than a cent. When I woke the laptop from standby the consumption went back up to 24 watts. I assume this is because the charger is providing live power to run the laptop, but not needing to charge the battery. Overall I think the lesson is that leaving the laptop charger plugged into the wall is does not waste electricity, but leaving the laptop plugged into it and in sleep mode does consume electricity. However, if you leave your laptop unplugged in sleep mode, you will still need to charge up the battery when you do plug it in later. To be really effecient on power you need to turn off your laptop completely or else put it into hibernate mode if you are not going to be using it for a long time.